Imagine you could take a time machine back to, say, the late 1800s in New York City. You’re walking down the sidewalk and pass a dead horse lying on the cobblestone street. It’s the same dead horse that lay there yesterday…and the day before. Everywhere you turn there are piles of trash. Most other city folks have grown accustomed to the smell, but to a newcomer like you—accustomed as you are to proper sanitation—the mingling odors of manure, urine, dead animals and other wastes nauseates you. If you lived in this environment long enough, your chances of contracting a contagious and perhaps deadly disease were very high. 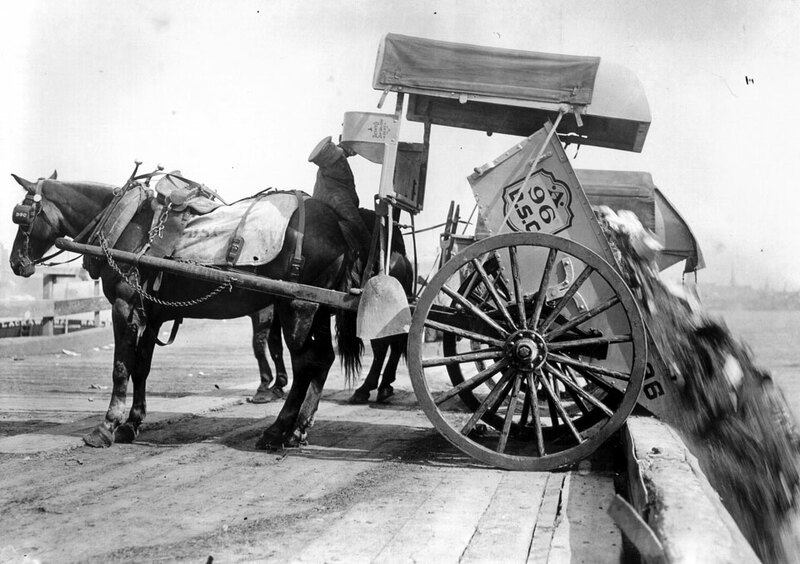 It’s tempting to look back through history and wish you were born into a “simpler time.” The fact is the health and sanitation laws and regulations on disposal of biohazardous waste that are in place today make our cities and towns much more pleasant (not to mention healthier) than in those halcyon days of yore. Take sanitation workers. We don’t spend a lot of time thinking about how these men and women make our lives better just by virtue of doing their job. Yet the majority of Americans enjoy clean water and air. When you walk to work every morning you don’t have to tramp through dangerous human and animal waste clogging the streets and sidewalks and overflowing into the oceans and rivers. In the U.S. and England in the 19th century, there was a much different standard of sanitation than these countries enjoy today. That began to change in the mid to late 1800s. British sanitary reformer Edwin Chadwick famously conducted research into the poor conditions of prisons and hospitals in England. His research precipitated the passage of the Public Health Act of 1848 and inspired reforms in the United States. U.S. 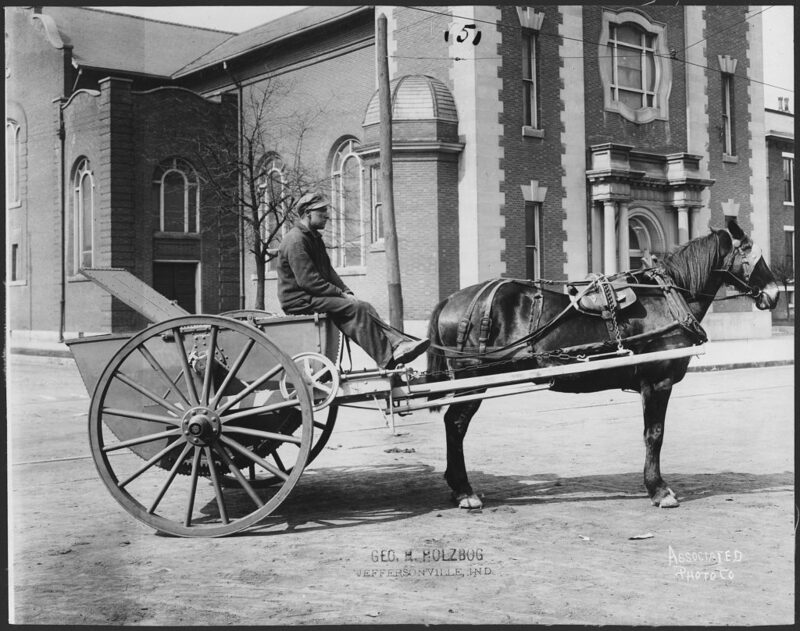 Colonel George E. Waring, a cavalry officer in the Union army, helped to establish sanitary engineering as a profession, which boosted its presence in modern life. Fellow Briton Joseph Lister was the first to connect modern germ theory with medical sanitation. The germ theory of disease linked the existence of microorganisms, or germs, to the onset of diseases. Humans acted as hosts for these microorganisms, and their growth and reproduction caused illness. In the 1870s Lister applied the germ theory to hospital-borne illnesses, with poor medical sanitation the cause. According to the medical journal Modern Drug Discovery, modern sanitation efforts led to Americans enjoying longer lives. Most medical historians believe that the sanitation movement, and its attendant improvements in urban health and food safety, contributed far more to the increase in Western life expectancy in the 20th century (primarily through the prevention of infectious diseases) than did much of modern medicine. Indeed in the twentieth century waste technology began to improve by leaps and bounds, and stricter sanitation laws were introduced. The purpose of the Solid Waste Disposal Act of 1965 was to reduce waste and protect human and environmental health by introducing waste management technologies and standards designed to decrease pollution and promote better municipal waste disposal. There were those who didn’t feel the SWDA went far enough. In the summer of 1988, medical waste washed up on five East Coast beaches. Congress responded by enacting the Medical Waste Tracking Act of 1988. Regulations on how medical waste could be disposed of became more stringent—and as a result our environment is cleaner and our lives are healthier. So the next time you see one of Cyntox’s medical waste professionals doing a pickup of your red bags and sharps containers, take a moment to reflect on what your work and home life would look life without the benefit of good biohazardous waste management! Pharmaceuticals are more popular than ever, with 7 out of 10 Americans taking one or more prescription drugs—including antibiotics, antidepressants and pain-blocking opioids, according to researchers from the Mayo Clinic and Olmsted Medical Center. With such massive quantities of prescription pills being generated each year, medical facilities, pharmacies and patients are facing the problem of what to do with all their leftover and expired medications. Improperly disposing of pharmaceutical waste can cause environmental damage and poses a threat to human and animal health. For businesses that are discovered illegally dumping their pharmaceuticals, it can also mean costly lawsuits and a tainted public image. In 2012, the drugstore chain Walgreens was slapped with more than $16.5 million in damages for “illegally dumping pharmaceutical and biohazardous wastes throughout California.” As part of the lawsuit settlement, Walgreens also agreed to “fund environmental projects that will further consumer protection and environmental enforcement” in the state. The same year and also in California, the popular chain CVS “agreed to pay $13.75 million in a settlement to resolve claims that it violated environmental law over a seven-year period by improperly storing and disposing of pharmaceutical and medical waste.” Their agreement also required the company comply with California’s rules of how to properly dispose pharmaceutical waste. And in 2013, the drugstore chain Rite-Aid paid $12.3 million dollars after they were charged with dumping “toxic, corrosive or ignitable materials ranging from pharmaceuticals and pesticides to paint, aerosols, and bleach in local landfills over the course of six and a half years.” They were tasked with instituting an environmental protection training program and partnering with medical waste disposal companies compliant with state medical waste regulations for safe collection and disposal of their pharmaceutical waste. The fallout for these major pharmacies went beyond the hefty fines—it was also a public hit to their brand’s image. If you are a company in the business of preventing and treating disease, being caught improperly dumping pharmaceutical waste that threatens environmental and human health does not make for positive publicity. Evidence suggests that prescription drugs pose a significant danger to the environment—but pharmacists, other medical professionals and even patients themselves can play a role in prevention. A long-term solution to the proliferation of so many prescription drugs is promoting better public health programs and advising patients of prescription-free alternatives to wellness that lessen the need to produce large quantities of prescription drugs in the first place. The next best solution is learning and following your state’s regulations for safe disposal of your pharmaceutical waste. If you are a hospital, pharmacy or other medical facility, check out tools for safe pharmaceutical waste disposal for health systems here. 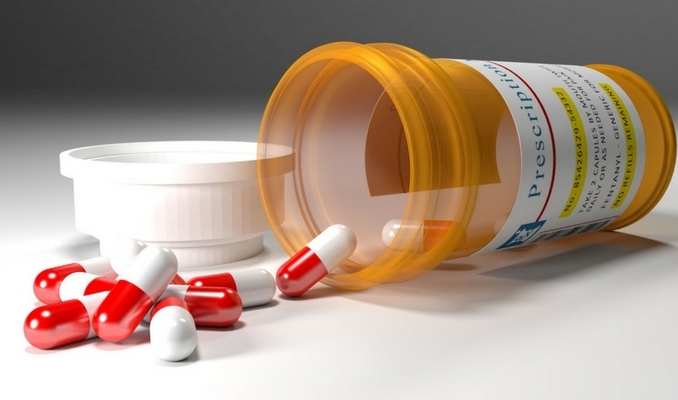 The FDA advises individual patients with unused and expired medications to first consult the medication bottle for instructions on proper disposal. Although some medications may be safely flushed down a toilet or sink, many others should never be flushed—so patients should be told to carefully read the instructions on their medication before taking action. Certain other drugs can be thrown in with the household trash, but they should be mixed with undesirable garbage or sealed in a container so that animals or humans seeking unused drugs illegally won’t pull them out of the trash. Again, it is best for patients to first consult the instructions that come with their particular prescription. Individuals can also research local programs that allow them to drop off their medications at a central location for proper disposal. Local law enforcement agencies can help people who are interested in locating these programs. The DEA also offers mail-back programs and drop-boxes for unused drugs. Individual consumers can get more guidelines on the safe disposal of pharmaceuticals here. Hospitals and medical facilities can also get help from waste management companies like Cyntox. 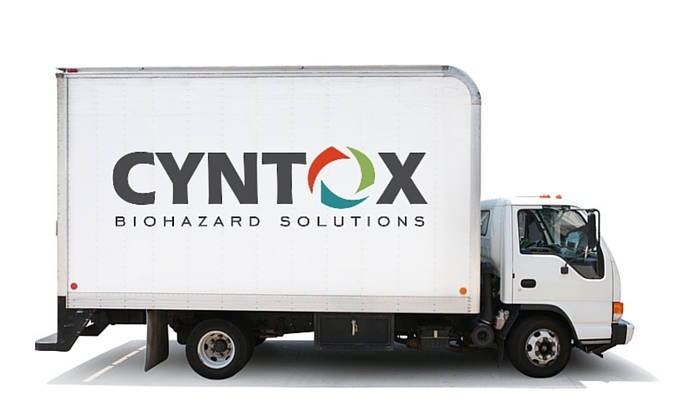 With locations in 44 states, Cyntox is familiar with the regulations in every state we serve and can keep your business compliant with regulations for pharmaceutical waste. Give us a call today for a free quote. The most frequently asked question we hear from medical professionals and staff members is “how much will medical waste disposal cost?” Our answer is always the same—it varies. There is no one price for every client. What we can tell our potential customers up front is what variables go into the final cost. The good news is once the rate is assessed, it won’t suddenly spike due to hidden fees. 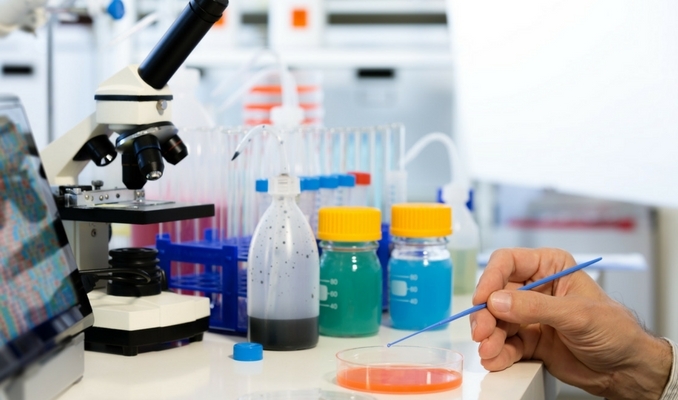 So what goes into the formula for determining the cost of your medical waste disposal bill? There are three major factors and some minor ones. How much medical waste are you generating? That is a factor in determining the cost. In this case, more is better. It will cost you less if you are generating a high volume of medical waste than if you only fill your receptacle about once a month. What state are you in? Each state has its own regulations about what constitutes regulated medical waste (RMW). For example if you are located in California, their definition of RMW is going to be different than Arizona or Rhode Island. So the price will vary based on different state regulations. Cyntox, which has locations in 44 states, is familiar with the regulations in each state and can keep you compliant with your local regulations. The second consideration is, are you in the city, a suburb or a rural area? If you’re in an urban area chances are the medical waste disposal company has several clients on your route already and so adding your practice to the list won’t be a big deal. If you are located in a more remote area, however, it is going to cost more because A. the truck will likely be going out of their way to get to you, perhaps even making a special trip and B. the cost of fuel will be higher. Like with volume, the frequency with which you have your medical waste picked up will affect your price. The more frequent the pick-ups, the less it will cost. That being said, make sure you are not having your bins picked up half-full. Just like with so many things in life, you need to find the happy medium between having your bins picked up promptly and not getting over-serviced. A good medical waste company can help you make an assessment of how frequently you’ll need to schedule pickups based on factors like average RMW volume. In addition to these top three factors, there are a few other variables to keep in mind. 4. What kind of waste are you generating? Are you generating pharmaceutical waste? How about trace chemotherapy and pathological waste? These kinds of wastes are generally treated separately and so may affect your grand total. 5. Does your staff require training? Companies like Cyntox offer clients BBP Training to satisfy the annual OSHA Bloodborne Pathogens requirement on exposure control principles and practices. There’s also Hazcom Training, which satisfies OSHA’s Hazard Communication Standard, and HIPAA Training, which satisfies the HHS privacy requirement. Adding these trainings to your bill will affect the price. 6. What is the quality of the medical waste management company’s customer service? And what about the drivers—are they reliable, safe and punctual? Companies that offer top-notch customer service with easily accessible representatives to answer your questions, as well as excellent drivers with top-notch safety records, will cost you a little more in manpower but will provide peace of mind. Just like with any service, you get what you pay for. Medical waste disposal is not an area where you want to go with the cheapest provider! You could end up with a medical waste management company with insufficient insurance in the event of a truck spill. Or you may find that the cheap company isn’t making frequent or consistent pick-ups or isn’t versed in your state’s regulations. You also need to be on the lookout for companies who offer a cheap introductory price but then toss in a lot of hidden fees that you only discover six months down the line and already roped into a contract. Although your costs are affected by the variables above, you can be assured that Cyntox does everything it safely can to slash your rates. And once your rate is determined, you won’t be surprised when you actually get the bill. Our invoices ALWAYS reflect the agreement you signed. We will never pull a bait-and-switch on you by unexpectedly raising the price. There is no fine print in our contracts and we offer a 90-day, commitment-free grace period so you can try us out and make sure we fit your needs before signing anything. Besides the service fee, the only additional fee is a 10% fuel charge fee, and if you are located in New York, Connecticut, New Mexico or Arkansas we are required to put a tax on your service. It pays to do your homework and shop around, and we encourage you to do so. We are confident that once you do the math and compare what you’ll get for the price, Cyntox will be at the top of your list. Proper medical waste management is vital in protecting the welfare of our health care workers, staff and patients. Taking a wider view, it is also crucial to the health and safety of our communities and the environment. Good medical waste management includes proper handling, storage, transport, processing and disposal of waste. The consequences of negligence in this area can be dire. When you choose to outsource your medical waste management, you demonstrate a commitment to your workers and to the community. You are guaranteeing that skilled workers who are trained in the safe collection, handling and transportation of medical waste are on the case and doing their part to protect your facility. But even if you outsource your medical waste management, you still have an important role to play in health and safety. Your prime responsibility as a health care facility becomes the proper handling and storage of medical waste before it is picked up and taken off-site. The rule of thumb with medical waste disposal is timely discard as close to the point of waste generation as possible. That means assessing the types of waste you will generate in a specific setting and then making sure you have the proper, labeled receptacles close at hand. In that assessment, your medical facility should make sure its compliant with your state’s guidelines on what constitutes medical waste. If you are using an off-site medical waste disposal company, make sure they too are up-to-date and compliant on the latest regulations for your state. Check this interactive map of state environmental agencies and list of state health agencies for more information. Proper medical waste receptacles and bags should be made of combustible, non-halogenated plastics and should be color-coded and labeled for the type of medical waste they contain. Color coding and labeling helps avoid any confusion among healthcare workers as well as those who handle removing your medical waste to take it off-site. As a reminder of what goes where, post instructions on waste separation and identification at each waste collection site. Some common medical waste containers. Chemical and pharmaceutical waste should be disposed in a brown plastic bag or container and general health care waste in a black plastic bag. 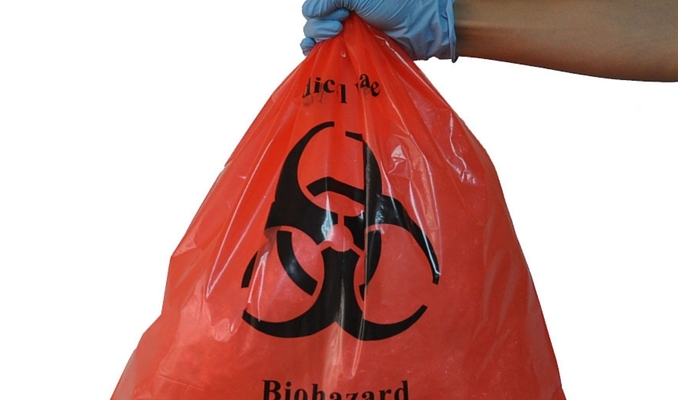 Infectious waste that comes from lab cultures, surgeries or autopsies on patients with infectious diseases, and infected lab animals should be discarded in strong, leak-proof yellow bags or containers. Infectious waste containers and bags should always be marked with the international infectious substance symbol. If you are handling highly contagious infectious materials, it should be sterilized as soon as possible by autoclaving. Make sure this waste is immediately disposed of in a yellow container capable of being autoclaved. Consult your medical waste disposal company for more information about guidelines for color-coding and labeling your medical waste, as well as the handling and swift disposal of highly contagious materials. 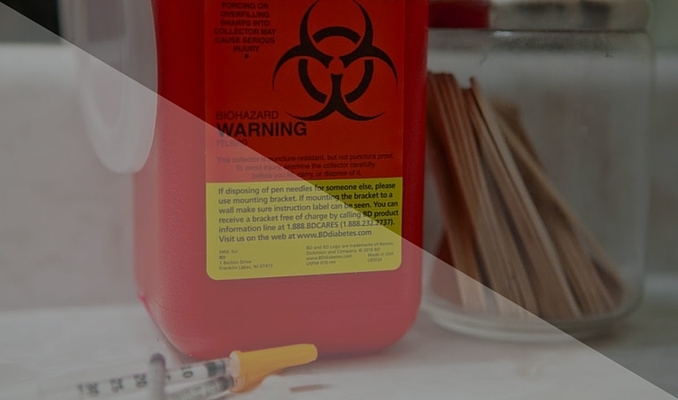 Proper sharps disposal is an important component of your overall medical waste disposal plan. “Sharps” are any medical devices with sharp points or edges that can puncture or cut the skin; they include needles, syringes, lancets, and auto injectors like insulin pens. According to the CDC, “Occupational exposure to bloodborne pathogens from needlesticks and other sharps injuries is a serious problem, resulting in approximately 385,000 needlesticks and other sharps-related injuries to hospital-based healthcare personnel each year.” Injuries from sharps are associated with hepatitis B and C, HIV, and more than 20 other pathogens. Everyone from health care workers to janitors and other cleaning personnel can suffer injuries from encounters with improperly discarded sharps. Beware: Sharps are called sharps because they are… sharp! Negligence in sharps disposal can also result in steep fines. In April 2016, Cooper Hospital was fined $55,000 by The Occupational Safety and Health Administration (OSHA) for various employee training violations, including not teaching them to immediately discard “contaminated sharps, such as needles, in appropriate containers” and improperly labeling their sharps containers. 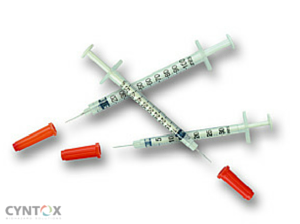 Sharps injuries can be avoided by disposing of each needle properly after its one-time use. Your waste management company will supply you with the appropriate marked containers. 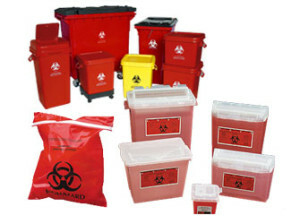 The CDC recommends organizing your work area with the sharps disposal containers within reach. They also warn against overfilling the containers and advise workers to keep fingers away from the opening of the receptacle. 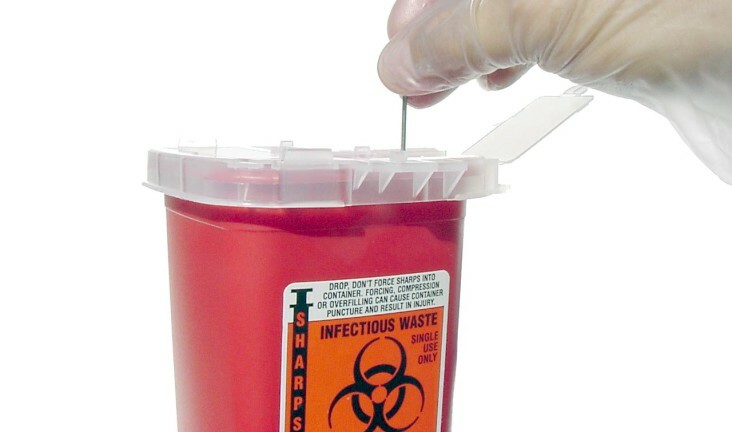 Most containers come with a hole to insert the sharps. Make sure to let other hospital personnel know if you see a needle that has been improperly discarded—in a trash bin or other receptacle that is not labeled as a sealed sharps container. Let someone know immediately if you see used sharps in linens, beds, or on the floor. It is advisable to remove medical waste receptacles once they are three-quarters full. Good medical waste management companies follow a regular pickup schedule so your waste is never sitting idle for too long, but in some instances you may want to arrange for a special pickup and removal. By consistently following these simple guidelines, you will not only help your medical waste management partner to better serve you; you will also have peace of mind that you are doing your part in protecting your greatest assets: your staff and patients. What Happens To My Medical Waste After It’s Taken Away? For some people, out of sight is out of mind. But if you DVR “How It’s Made” on the Discovery Channel or regularly spend time on websites like HowStuffWorks.com, you might be just a little curious. What exactly happens to all your organization’s medical waste once the bags and containers are hauled away? First, let’s go back a few decades in history. In the summer of 1988, medical waste washed up on five East Coast beaches. Medical waste appearing on our shoreline is almost as scary a prospect as bloodthirsty sharks, and a public outcry ensued. Congress sprang to action, enacting the Medical Waste Tracking Act of 1988. Regulations on how medical waste could be disposed of became more stringent. Fast forward to the present. Today we know more about the risks of poor medical waste management. It is helpful to keep in mind a statistic from the World Health Organization (WHO), which states, “about 85% of waste generated by healthcare is general and non-hazardous waste. 15% is considered hazardous.” Also, at the conclusion of the Medical Waste Tracking Act in 1991, the EPA determined that healthcare professionals face a higher risk handling infectious waste at its source than the general public once the waste is disposed of and time has elapsed. Of course, when it comes to medical waste disposal of any kind, safety and compliance are still crucial elements in keeping the public and environment healthy. It is now up to each state’s environment and health departments to decide how to best regulate the collection, transportation, treatment and disposal of their state’s medical waste. You can read up on your particular state’s regulations here. 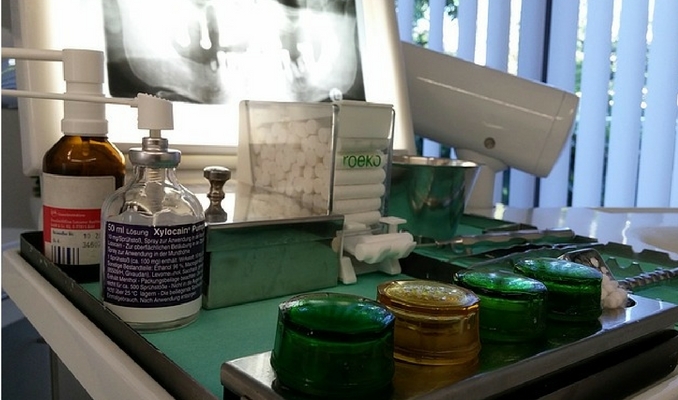 Segregation: what treatment does the waste require? Packaging: what receptacle does it get stored in before it’s transported? Transportation: medical waste must be safely and securely transported to a treatment or disposal facility. Treatment/Destruction: Depending on if the medical waste is Regulated Medical Waste (RMW), a treatment or destruction method must be assigned. Disposal: The treated medical waste is disposed of in a landfill or approved sewer system. Having a medical waste disposal provider who is timely and dependable is the first requirement for any efficient disposal process. Medical waste—even when it is safely contained in the proper receptacle—is not something that should sit around for too long. Once it is picked up, the trained driver must follow strict protocols for transporting the waste. 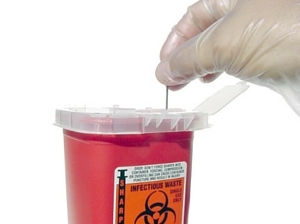 Different kinds of medical waste need to be segregated in the truck, and the truck needs to be marked so other drivers on the road know it is carrying potentially infectious materials. Having a protocol in place in the event of an accident, including a spill containment and cleanup kit on every truck, is also necessary. Once the medical waste arrives at its destination, it’s ready for treatment. According to the EPA, before 1997 “more than 90% of potentially infectious medical waste was incinerated”—often on-site, where the waste was generated. But new emission standards for medical waste incinerators spurred alternative methods, and now several additional options for treatment of RMW and non-infectious medical waste exist. These methods include steam sterilization, chemical disinfection with grinding or encapsulation, thermal inactivation, irradiation, grinding and shredding, and compaction. The type of method used depends in part on what type of medical waste is at issue—is it sharps, cultures and stocks or human blood? All need to be treated in specific ways. Steam sterilization is using saturated steam within a pressure vessel (sometimes called an autoclave) to kill infectious properties in the waste. Chemical disinfection with grinding or encapsulation involves grinding the waste in a hammermill while also using a chemical disinfectant. Thermal inactivation uses the transfer of heat to reduce infectious properties in the waste. Materials that can’t be treated thermally can be irradiated. Irradiation exposes waste to ultraviolet or ionizing radiation to break down infectious agents. Finally, compaction is a method to reduce the volume of waste. It is not a treatment method, per se, but it can transform the waste into something unrecognizable—another essential element of the disposal process. Once solid medical waste is treated, it is considered municipal waste, and it is shipped to a sanitary landfill. If the waste is in liquid form, it can be sent to a health-department approved septic system or sanitary sewer system for further treatment at a wastewater plant. So the next time you see your sharps bin or your medical waste boxes carried off, know that great care is being taken to safely dispose of it for good. Do you want to learn more about medical waste? Hear the greatest and the latest from our medical waste experts! Learn how to save money and run your biohazardous waste program more efficiently. 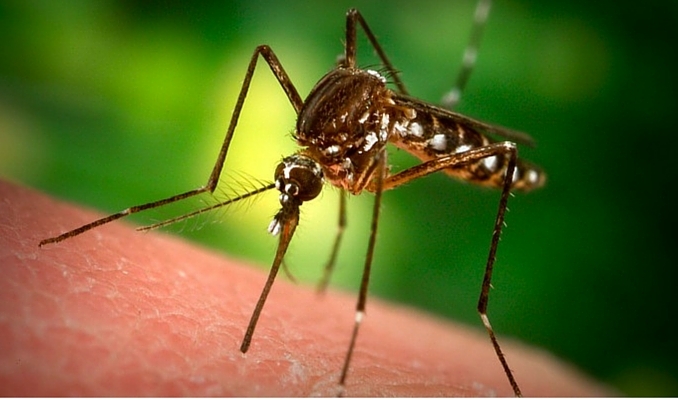 The latest mosquito-borne disease to cause concern in the medical world is the Zika virus. Although the first cases of Zika in humans were discovered in Uganda and Tanzania in 1952, an outbreak in Brazil and Colombia in 2015 made national news in the U.S. So just how prevalent is Zika, how does it spread and what harm can it cause? Zika has been called an emerging virus: According to the World Health Organization (WHO), “from 1 January 2007 to 6 April 2016, Zika virus transmission was documented in a total of 62 countries and territories.” WHO has declared the virus and associated birth defects an international public health emergency. Spread mainly through mosquito bites, WHO recently stated that six countries (Argentina, Chile, France, Italy, New Zealand and the United States) have now reported locally acquired infection through sexual transmission from an infected man to his partners. Zika can also be spread from mother to child during pregnancy or around the time of delivery. Some cases of transmission through blood transfusions have been reported in Brazil. According to the Centers for Disease Control and Prevention (CDC), symptoms of the virus are generally mild and include a low fever, skin rash and conjunctivitis—what is commonly known as “pink eye.” These symptoms usually last less than a week. However, some patients are asymptomatic. Zika can be diagnosed in the laboratory by testing serum or plasma to detect virus, viral nucleic acid, or virus-specific immunoglobulin M and neutralizing antibodies. Currently, there is no specific antiviral treatment available for Zika virus disease. Rest, fluids and the use of analgesics and antipyretics are recommended. The CDC is advising health care providers with patients who are complaining or actively displaying symptoms of the Zika virus to ask their patients about their recent travel history. If they suspect the presence of the virus, it should be reported to their state or local health department. The CDC reports that the number of cases in the United States is relatively small right now, at 358 patients (as of April 13, 2016.) Furthermore, all 358 cases were travel-related. Locally acquired Zika cases have been reported in the U.S. territories of Puerto Rico, the U.S. Virgin Islands and American Samoa. Estimates put the number of cases in U.S. territories at 471 (as of April 13, 2016.) Authorities are paying particularly close attention to Puerto Rico because of the quick spread of the virus in that territory. It’s important to note, however, that the mosquito that transmits the virus, Aedes aegypti, is present in more U.S. states than previously believed. According to a recent article in TIME, the current state count is 30. As spring turns to summer and humidity rises, the number of states with the Zika-carrying mosquito could increase. Microcephaly is a condition where a baby’s head is smaller than normal because the brain has not developed properly during pregnancy. Depending on how severe the birth defect, Microcephaly can cause related problems such as seizures, developmental delays, intellectual disability, problems with movement and balance, feeding problems, and hearing and vision loss. It has also been found that Zika can cause premature births. According to BBC News, a Zika vaccine is in development and could be ready for human trials as early as September. Again the focus of the vaccine is for pregnant women to prevent microcephaly in their infants. So just how worried should you be about the Zika virus? As Zika is a developing story and medical experts are learning new features of the virus that indicate Zika is worse than they originally thought, we recommend vigilance. This includes staying informed and taking precautions in areas where mosquitoes are present by wearing insect repellant containing DEET (diethyltoluamide) or IR 3535 or Icaridin and proper clothing that covers exposed skin, like long pants and long-sleeved shirts. If you are pregnant or plan to become pregnant in the next eight weeks, it’s advisable not to travel to areas where Zika is prevalent. Clean water, sanitation and hygiene are all factors in preventing disease, particularly mosquito-borne viruses like Zika. Proper biomedical waste management, including laboratory waste management and syringe and sharps disposal, are also essential safeguards against the spread of disease. If you have any questions about medical waste regulations in your area, please contact cyntox.